For the region, see Mugello. The Mugello GP was revived in 1955 and from the 1964 to 1969 as a Targa Florio-like road race consisting of eight laps of 66.2 km each, including the Passo della Futa of Mille Miglia fame. The anticlockwise track passed the towns of San Piero a Sieve, Scarperia, Violla, Firenzuola, Selva, San Lucia. It counted towards the 1965, 1966 and 1967 World Sportscar Championship season. The last WC race was won by Udo Schütz and Gerhard Mitter on a Porsche 910. After two Porsche wins, the local fans could celebrate again in 1968, when the Alfa Romeo Tipo 33 driven by Luciano Bianchi, Nanni Galli and Nino Vaccarella prevailed over the Porsche driven by Rico Steinemann and Jo Siffert, and in 1969, when Arturo Merzario won with an Abarth 2000, and he won again in 1970 with the same car, where Abarth prevailed 1-2-3 with Leo Kinnunen and Gijs Van Lennep finishing 2nd and 3rd respectively. The 1970 event brought about the end of the 66 kilometer Mugello public road circuit; a seven-month-old baby was killed when local racer Spartaco Dini crashed his Alfa Romeo GTA into a group of people at the village of Firenzuola during a private test there, when the roads were open to the public (the roads were only closed on race day and for qualifying; and left open for every other day including open practice for the event). Four other people, including 2 young children were seriously injured. Although there had only been one previous fatality at the original Mugello circuit (Günther Klass in 1967), this happening put a bad stain on the whole event, and the 1970 race turned out to be the last one held on the public road circuit, which was won once again by Merzario. After this incident, Dini spent 2 months in jail, and after his time served he moved out of Italy and did not return for years. 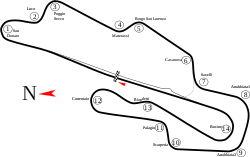 The circuit was used over 1–3 May, for the in-season test during the 2012 Formula One season, by all teams except HRT. The track was praised by Mark Webber, who stated that he "did 10 dry laps today around Mugello, which is the same as doing 1000 laps around Abu Dhabi track in terms of satisfaction". Four-time Formula One world champion Sebastian Vettel was impressed too, saying that “unfortunately we don’t have this track on the calendar. It’s an incredible circuit with a lot of high-speed corners”. It holds a grade 1 FIA license, meaning it meets the standards to host a Formula 1 race. An unofficial track record of 1:21.035 was set by Romain Grosjean during the test. ^ "A1GP : News". A1gp.com. 21 August 2008. Retrieved 2 May 2009. ^ "World Championship 1967". Wspr-racing.com. Retrieved 2 May 2009. ^ "Mark Webber about Mugello circuit". Twitter. Retrieved 3 May 2012. ^ "Sebastian Vettel on Mugello". James Allen on F1. Retrieved 3 May 2012. ^ "List of FIA licensed circuits" (PDF). 6 February 2015. ^ "Mugello day three - Grosjean ends test on a high". formula1.com. Retrieved 12 October 2014. ^ "Grand Prix winners 1919–1933, The golden era of Grand Prix racing". Kolumbus.fi. Retrieved 11 December 2010. ^ "Non Championship Races, The World of Sports Prototypes Racing". Wspr-racing.com. Retrieved 11 December 2010. ^ "World Sportscar Championship, The World of Sports Prototypes Racing". Wspr-racing.com. Retrieved 11 December 2010. ^ "Gran Premio di Mugello, The Racing Line". Theracingline.net. Retrieved 11 December 2010.